The Blues scored a goal in each period. T.J. Oshie picked up his third of the season on the power play at 12:59 of the first period as he tucked a shot in under the glove of Pekka Rinne. Patrik Berglund battled in front of the net to get the puck to Oshie. It was the Blues 7th power play goal in 12 chances this season. 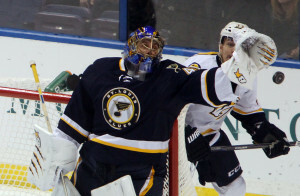 In the second period, Berglund scored on a penalty shot, his second of his career. Ironically, his first penalty shot goal came exactly one year ago on Jan. 24. In the third, rookie sensation Victor Tarasenko notched his fourth goal of the year, beating Rinne with a wrist shot. He now has six points in his first four NHL games.